A ’70 Chevelle so advanced, it must have come from the future. 1970 Chevelle Convertible: Out of Time. I grew up with Chevys. I have been involved with them my entire life, and I’m blessed to have a fully supportive wife who loves cars. After spending 35 years building hotrods, I’ve learned that not all cars are created equal. Some of the builds were just builds and others were nightmares – but this 1970 Chevelle took the cake. We spent over 2000 man hours building this masterpiece. I chose this Chevrolet because I wanted to build a pro touring Chevelle convertible. 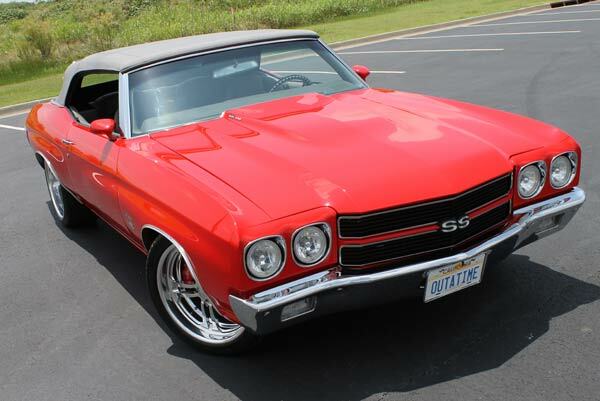 I purchased the car from Bruce Smith (Chevy Classics Tennessee State Rep), along with one other 1970 Chevelle. This one originated in southern Indiana. When I got it, Mr. Smith already had the car well on its way with the help of his designer, Chris Stokes. Master builder Dallas Robertson and a team of builders at Tommy’s Rod Shop poured their blood, sweat and tears into this car. Howard Dority did all the wiring. All told, almost a year was spent on the assembly, and two years on the body and metal work. After the body work had been completed, it was then put on the rotisserie and the final prepping for paint was started. 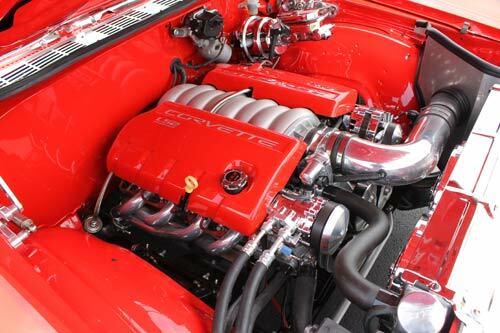 The most impressive part of this build was the very, very deep PPG Torch Red exterior paint, which was sprayed by Bubba Lampley of Clarksville, TN. We love to build high-end cars. After we assembled the car, it went out for an interior; the color of choice was tough. 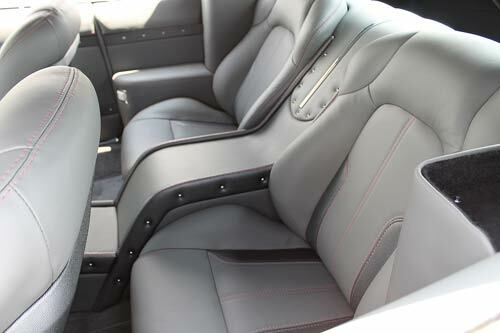 After months of consideration, we decided on a luscious gray leather. 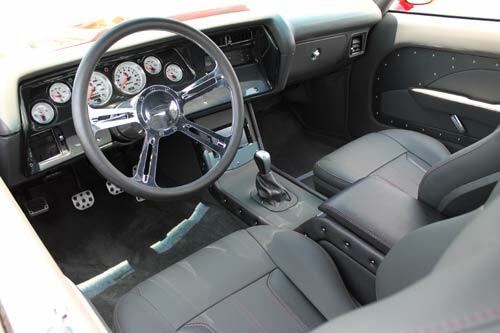 Les Lockridge, a master craftsman from Southern Hot Rod, hooked it up with a taupe gray leather interior and a gray top, not to mention the most comfortable seats in the world. This machine is a bad boy – almost too nice to drive. 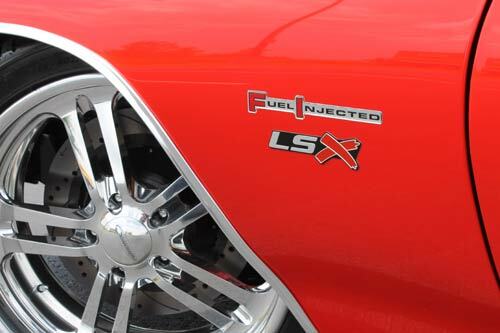 The LS2 is backed by a 6-speed Richmond Gear transmission and 3.90 gears. It’s tranquil to drive and very responsive. It was dyno’d and tuned at DBR Performance – those guys did incredible work. We used Wilwood Brakes, Billet Specialty wheels, Michelin tires, March Performance, Spectra Performance, Dynamat, and Camaro Central – thanks Ben! The car was fitted with 3-inch front to rear exhaust by Stainless Works, all brake and gas lines are stainless steel, the wiring is by American Autowire, air by Vintage Air, power windows by Specialty Windows, and gauges by Auto Meter. This beast really draws a crowd, no matter where it goes! I was very disappointed that I was not able to be at Chevy Classics 38th International Convention last July, where the Chevelle scored an remarkable 998 points. What a score! I was at the hospital instead, where my first grandchild, Lakin Kash, was born. The show was intense, the anxious feeling was there; my mind was in Oklahoma, my body was at the hospital, but once I got the news of a 998, I felt good. The hard work paid off. Those guys did a very good job, very thorough. The judges were on this baby for hours. My mechanic, Ed Milliken said, “Tommy, they are even on the ground with flashlights scoping and inspecting every inch of the car.” Maybe I’ll send our next masterpiece to Oklahoma to see how much our skills have paid off over the year. I am very grateful and blessed to have had the opportunity to build such a timeless jewel!